As Malaysians head to the polls this Sunday in what the BBC calls the nation’s “most hotly contested general election,” most report feeling satisfied with the direction of their country. The Barisan Nasional (National Front) coalition, along with its predecessor the Alliance Party, has been Malaysia’s dominant political force since independence in 1957. But BN’s hold slipped in the 2008 election — the 140 seats out of 222 it won marked the coalition’s worst performance in decades. And the opposition coalition, Pakatan Rakyat (People’s Alliance), led by former deputy prime minister Anwar Ibrahim , is pressing hard to finally gain power at the national level. Malaysia’s estimated 13 million voters will elect members of the federal Parliament and 12 of Malaysia’s 13 state legislative assemblies. In a survey conducted in March for a forthcoming Pew Research Center report, 82% of Malaysians said they were satisfied with the way things were going in the country, up from 76% in 2007. A similar percentage, 85%, called Malaysia’s economic situation good, up from 76% in 2007. Malaysia’s economy remains strong. Real GDP grew by 5.6% last year, according to the current World Economic Outlook report (pdf) from the International Monetary Fund; the IMF expects Malaysia’s economy to grow 5.1% this year and 5.2% in 2014. But consumer prices are growing as well. After rising 1.7% in 2012, the IMF expects inflation to average 2.2% this year and 2.4% next year. The BN government has spent billions of dollars subsidizing everything from rice and fuel to schoolbooks, according to the BBC report. 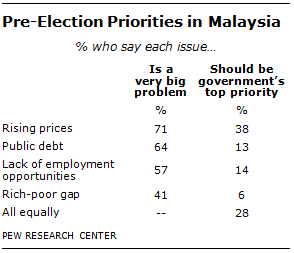 In the Pew Research survey, 71% called rising prices a “very big problem;” a 38% plurality said inflation should be government’s top priority, more than those citing lack of job opportunities, public debt or the gap between rich and poor. Here are more detailed survey results and a discussion of the methodology.